Her tips included the more obvious (have a professional photo, not a picture of Betty Boop), to the much less well-known, but very powerful (edit your headline so that it gives credibility, commands action, shows your USP, and gives a benefit – “Owner at XYZ Pty Ltd” says nothing to anyone). They were all great tips that I was excited to implement upon my return home that night. But there was one tip she gave that left me feeling rather embarrassed. Mortified, even. Because as a copywriter, I should have known better. Yet despite my professional knowledge (and what I do when writing for my clients all. the. time), I had committed a cardinal copywriting sin: my LinkedIn summary was all about me. There is a golden rule in copywriting. No, it’s not “do unto others as you would have others do to you”. That’s a golden rule in life. In copywriting, the golden rule is to always, always, without fail make your content about the reader. One reason your content should be about your reader or client and not about you is that content that’s all about you is boring. Content about your client is engaging. Besides, your readers and clients aren’t actually interested in you. They’re interested in what you can do for them. That’s why they visited your website, or your LinkedIn profile. They want to know what’s in it for them, and how you can make their lives better. So for heaven’s sake, don’t waffle on about yourself. Let them know how you can help! I’m about to let you into a copywriting secret, so listen up! The main way copywriters write content that focuses on the reader is by writing in the second person. In other words, using the most magical word of all: “you”. They also avoid using the less-than-magical pronouns “me”, “I”, and “we”. But how do you do this when you’re writing copy about yourself, such as on your website’s About page, or your LinkedIn summary? Actually, it’s easier than you might think. All you need to do is to twist your message so that it focuses on the benefits you can deliver to your clients, rather than focusing simply on what you do. Or, rather than “Our salon is open until 9pm on Tuesdays and Thursdays for everyone’s convenience”, why not try “To fit in with your busy schedule, you can make a hairdressing appointment at our salon on a Tuesday or Thursday night right up until 9pm”. Do you see how each of the second examples is about the client, not about the business? And they’re so much more engaging, too, right? 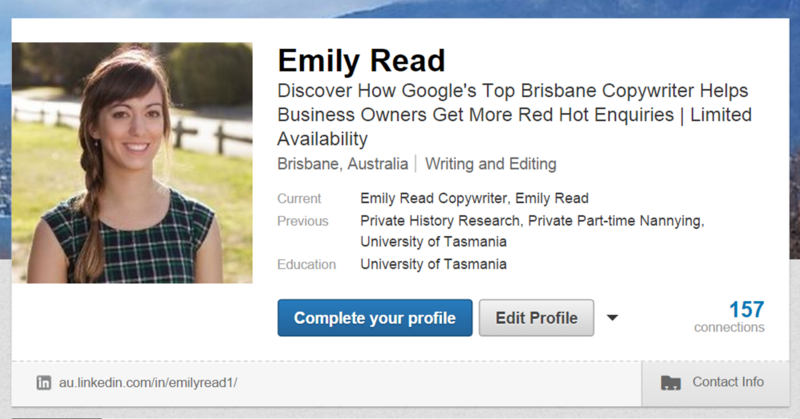 Last Thursday night, my LinkedIn summary received a serious makeover. You can check it out here. It’s not perfect, but you’ll notice that right from the get-go, it’s most definitely not about me anymore. Instead, it’s about my clients. When was the last time you updated your LinkedIn summary? If it’s all about you, then it’s time to give your LinkedIn summary a spring clean and transform it into some seriously client-centric copy! If you need help doing that, I know a great copywriter you can talk to 😉 Otherwise, go for it! You won’t regret that you did. If you have any questions or comments, I’d love to hear them. Pop them into the comments section below. Do you have a LinkedIn profile? Do you ever use it, or is it covered in cobwebs and slightly musty smelling? And on a scale of one to you, how would you rate your summary? I look forward to hearing about your LinkedIn stories and experiences! Want more tips on how you can win with social media for your business? Then you’ll love this post on how to promote your conference on Twitter.